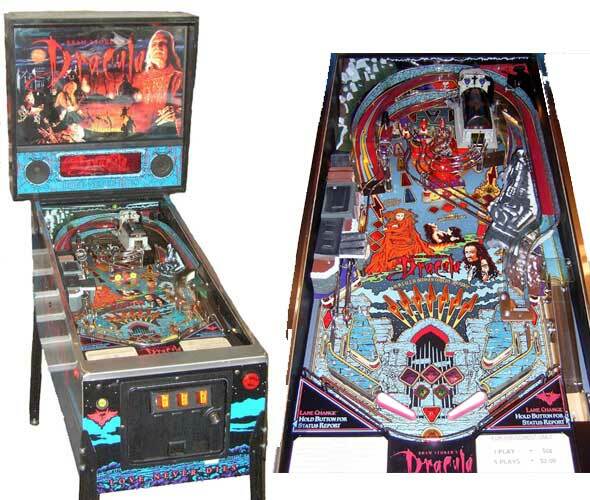 Check out these Bram Stoker's Dracula Pinball Machines For Sale by Williams. You will also find parts and accessories including the Magnet Mist Multiball, Ramps, Flyer, Sound Board, Flipper Rebuild Kit, Fuse Kit, CPU Rom Chip Set, Translite, Playfield Plastics, Target Set, Mods, and Custom Target Decals. The main objective of the game is to stack 3 multiballs Castle, Coffin, & Mist, kill bats and rats, and booya points!This machine was originally intended to become Alien 3, but securing the license didn't work out after numerous delays on the Alien 3 movie.